Sometimes I have the feeling that baking bread follows as many fashions as you can observe in cloth. The trend flour of the last years was the French ones. Nowadays it seems that Swiss Ruchmehl is the new “in” flour. (Ruchmehl is a light wheat flour that contains more bran than normal white flour.) But this is not my kind of philosophy. 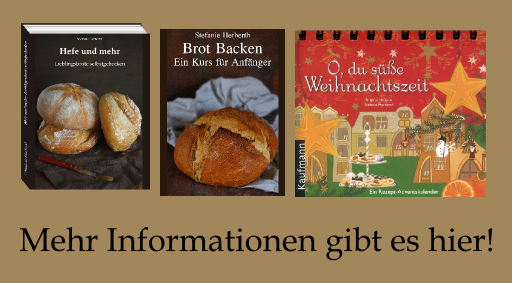 I like to buy my flour in our local mill in which Wheat from the Rhineland and Spelt from The Bergischen Land is milled into very good flour. Just like Arndt Erbel I prefer to bake with the things that grow in my nighbourhood. 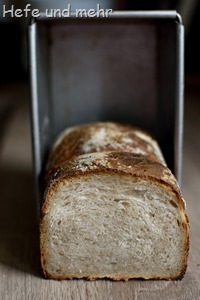 And I firmly belief that every baker has to school his or her feeling for the dough for produce a great bread. Of course a great bread needs to have a great ingredients, too. But these can be found in your home region, too. My rule is an easy one. I buy local flour. And when I in a new region, I buy the local flour there, too. This makes traveling much more exiting. And of course I bought some kilo Ruchmehl when we visited Basel – I like playing with new flour as much as everyone else does. Some time ago I showed this braids already while they cooled down on sunday morning. I promised to post the recipe, if they turned out nicely – and they did! So here it is. It is mainly a “use leftovers” recipe as it contains a bit of left over quark and some sweet starter after refreshing. The Quark adds a nice moistness to the dough and enhances shelf live. But the special turn in this recipe is the tiny bit of rye flour I added. As I learned last year from the Onjeschwedde is a small dose of rye good to enhance the crumb structure to extra soft and pillowy. Another point I love at weekends too is the fact that the recipe is great for proofing overníght in the fridge. So the next morning the only thing I had to do is placing the baking tray in the oven. Perfect for relaxed sundays! 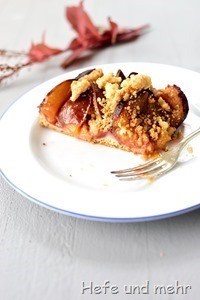 You can scold me for coming up with this recipe now, add the end of plum season. But the cake is too good to vanish for another year in the draft folder and I had to wait to try this idea for to long time. Problem was the freeze during spring that left us nearly no good plums. And so I had to wait for the late plums until baking this cake. The special twist I longed to try was baking the streusel separately. This helps do avoid soaked streusel and adds a nice crunch to the cake. The cake itself and the streusel recipe as well are old friends you know already. But combined they make a great team. Save the recipe for next year in case you get no plums any more! October means that its time again for World Bread Day. And as I baked bread in the wood fired community oven of our local history museum, I have a real “Backes Bread”. 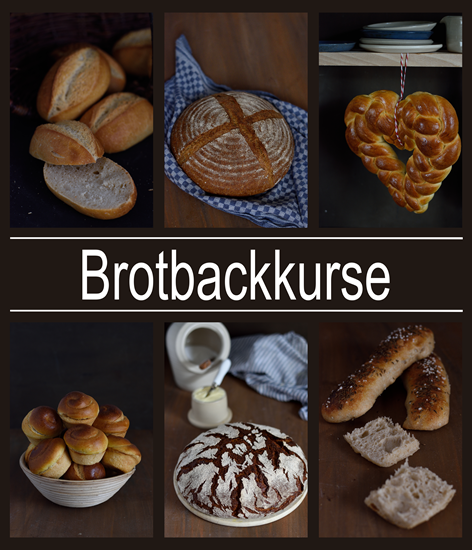 The Word “Backes” means community bread baking house in our dialect. And baking bread in such a “Backes” means sharing a great feeling of society. There are not so many other things that creates a sense of community then some loaves of bread made and shared with one another. And so this bread is a bread meant for sharing. 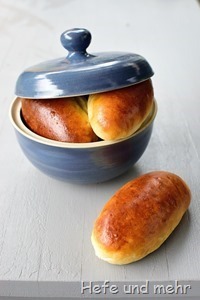 It is baked by placing two small loaves in one proofing basket. The ingredients of the bread is a bit inspired by leftovers: mashed potatoes, some quark and a bit of whole emmer flour. The Quark and Potatoes make the crumb moist while the emmer adds a deep nutty flavour. The breads left the oven with a real dark crust – something that can happen by this more archaic way of baking. 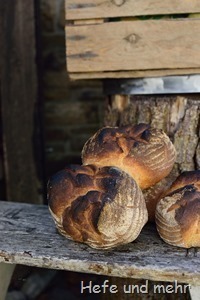 And it fits somehow very well with the bread, it adds a slight smoky flavour – and that goes extremely well with a bread from a wood fired oven. I stumpled about the Neheimer Stütchen during a guided tour in the cologne cathedral. It was the fact that Count Gottfried von Arnsberg IV. is buried as the only not clerical person. This prominat burial place he got because of a very generous gift to the cologne bishop – and to ensure that the people in his county would pray for him after his death he gifted a very good forest to the city of Neheim. The forest still exists and from the yearly gain of it several celebrations are paid: each year a wreath is laid down at his tomb in the cathedral, there are count gottfried games and all children of the city get a roll called “Neheimer Stütchen” at the 4th september. The Neheimer Stütchen is a sweet milk roll, a bit larger then normal and already that tempted me. 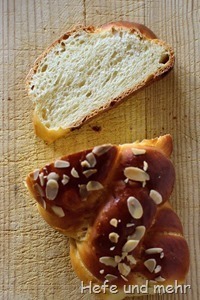 And as this story is such a nice one that it fits very well in my blog series of regional, traditional breads. 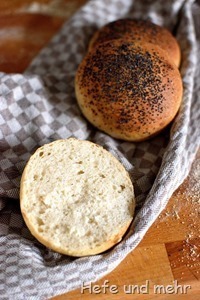 And so I baked my version of this roll, with a biga for aroma and a water roux for fluffy soft crumb. Since some months I did not bake breads made with sweet starter alone. But just now my starter is so active as never before. It just need 90 minutes to double its volume. It is in the perfect condition to rise even a bit heavier dough with some butter. And so it is in the perfect condition to rise burger buns. You need a real fit starter, so it makes sense to feed it two or three times before baking. Another important point is proofing the buns in a warm environment. The warm environment can be a slightly heated oven (30°C), then add a pot with boiling water on the bottom of the oven. This helps to keep the surface of the buns warm and moist and let them rise very well. The aroma of the buns is delicious, the cold rise of the dough and the combination of hazelnut oil and butter makes them very flavourful. The hint of hazelnut flavour goes very well together with my favourite vegan patty. But my dearest liked it very much in combination with a beef patty, too. Whenever I look at the recipe of the federweißer bread, I have to think about our old vintner. The old gentleman had his wine shop next door. And he would always tell us when the young wine (called Federweißer in Germany) arrived as he knew that my beloved one impatiently waits for the first bottle. As he turned eighty last year he decided to sell the shop and to enjoy his retirement. We wished him all the best – and were shocked when soon afterwards we got the news that he passed away. His heart just stopped beating the night after he sold his shop. Strange things happens sometimes… I still think about him now and then. After a mainly cold and rainy summer, the weather turned for some days just when school started. But this was just the last glimpse of summer we got. With the beginning of September it changed again and since then we have typical autumn weather – cold, sometimes rain, sometimes sun. When I drive to work I can see the valley filled with mist– it looks like little clouds snuggling into their beds before sun is waking them for the day. 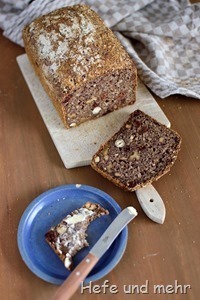 For me autumn is always the season to bake nut breads. And so I bake not only the dark spelt, nut & fruit in the wood fired oven last week, but as well a light spelt bread with hazelnuts and walnuts. 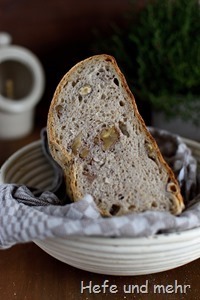 A deep flavour is archived by the combination of a spelt sourdough, a rye sourdough and a sweet starter. And due to the three lively sourdough adding yeast is theoretically not necessary. But as the community oven is not waiting for anyone I used a tiny bit of commercial yeast to keep fermentation well controlled and well fitted in the time schedule. And so et the end everything worked as planned: The oven spring was strong, the crust turned out crunchy and the crumb was fluffy. A perfect day for calm autumn days. I baked this bread in the last weeks already several times. One time with raisins, one time with dried apricots and walnuts, once just plain. And always when I start to bake a bread repeatedly it is a clear sign that I have a new favourite. I like the good balance of the hint of buttermilk sourness and the subtle sweetness of this bread. 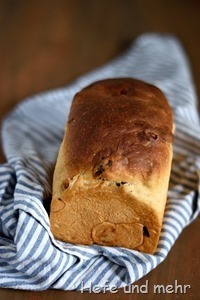 And if you add raisins or other dried fruits the bread moves a bit more onto the sweet side but is still well balanced. Freshly baked it is one of the breads I eat with just a dab of butter. Is there anything in the world that tastes better then a freshly baked sweet bread with fluffy crumb? I baked the bread in my new tiny 500g loaf pans. These pans are brand new in my baking pan collection and I already realized that they are perfect for baking such sweet breads or whole grain breads. 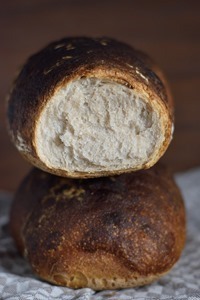 And it is perfect if you need some small loaves to share with family and friends!